I have a quick little project to share with you, using both Wings of Joy and Holiday Wonder and the Cosmo Cricket "Jolly by Golly" papers, which are available as part of the Christmas Key Ingredients kit and the Very Merry Christmas Bundle. Now if you know me, you know I prefer quick projects. It can take me hours just to decide what I'm going to do, so once the decision has been made, I avoid adding even more hours in production. So these little gift tags are perfect and you can "code" them by image or colour to the gift recipient. Christmas gift tags are one of my favorite projects, and I even love to do with my kids, because they are small and don't require a lot of design work, and my kids love to colour! They like to make their own tags that will go on the gifts to them...it makes keeping track much easiere LOL! 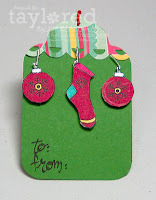 Gift tags are also a fabulous way to use up those scraps, because let's face it, you are just not going to want to use this year's designer paper next year. And while I do love to design and embellish, I try to hold back with gift tags, because they are just going to get ripped off and tossed without a second look. For this group I used an old punch by Emaginations, that I'm pretty sure is no longer available. However, there's good news! 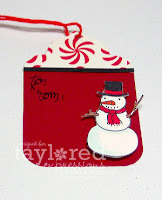 Taylored Expressions has gift tags available, only 10 for $1.00. That's a pretty easy add on when you pick up one of these fabulous stamp sets. All of the tags use the "Jolly by Golly" designer paper, and all images were coloured with the Copic Marker Christmas Kit To embellish I simply added some detailing with Sakura Glaze and metallic gel pens. The images were cut out and popped up with pop dots. The "to - from" stamp I borrowed from a retired SU set. The string is embroidery floss from my stash and that's all there is to them! You know, if you haven't already signed up to receive Taylored Expressions newsletter, you can easily do so by adding your email addy to the link on the upper right. Then you'll know when all the cool new items that arrive in the store! Thanks for letting me share these little tags! 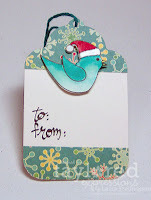 The images from Holiday Wonder and Wings of Joy work perfectly on these small tags as well as on a card or scrapbook page. They are a quick fun project and a great way to get in some quality Mom and me time! These are all SOOOO fabulous Laura! What an awesome idea and brilliant execution!! These tags can BE the gifts!!! Beautiful! these are SO cute, Laura! thanks for sharing!! These are so awesome Laura! I LOVE the idea of colour coding the gift tags for each recipient!! !